My good friend, Ross, rings me up out of the blue. “Let’s go to Bali” he says. Neurons fire in my brain as images of perfectly peeling waves consume me. “I’m in, let’s do it,” I respond. My wife, Maree and our colleague, Andrew, joined us for the adventure. The stifling heat and sticky humidity hit us square as we stepped off the plane at Ngurah Rai International Airport. Balinese security thought Andrew to be a fine African drug mule and searched every nook and cranny of his body and luggage. They even caressed his hair in awe, they’d probably never seen a pale drug mule from Africa before. Andrew survived the rubber glove and soon we found ourselves in the throngs of Bali traffic with trucks and scooters expertly weaving through the congested streets. 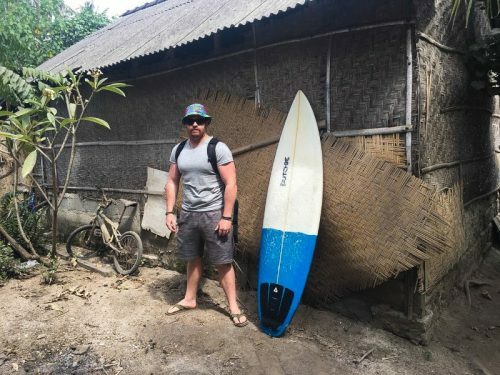 We arrived at our private villa in Bingin later that afternoon, frothing for a surf. With skegs in and wax on, we made our way down the steep steps to the beach. It was mid-tide and the waves were small. 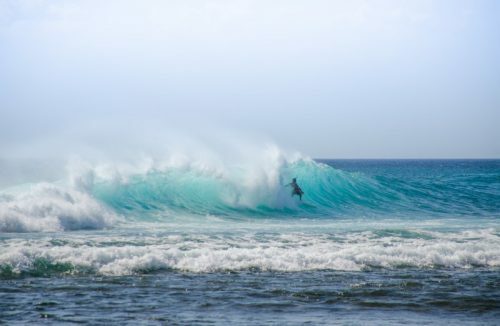 Further south, larger clean lines groomed by offshore wind rifled in at Padang Padang before offloading the last of their might at Impossibles. Further still, we could see larger sets pummeling the famed Uluwatu. The scene was magical and this heavenly place was our playground. 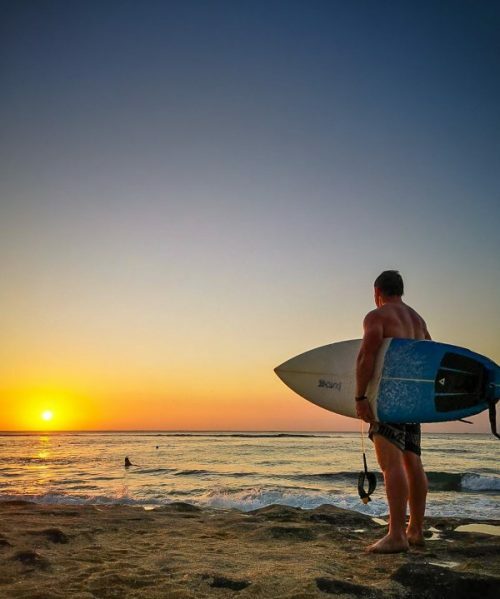 We shared waves in the golden glow and as the sun set over this watery wonderland, Bali welcomed us into her bosom. With a few Bintangs down the hatch, we were right as rain! My turn came soon after and I found myself drawing lines on a large, fast face that took me right onto the beach where I got drilled into the sand in front of wide-eyed Chinese tourists. We were overjoyed but hungry for more and as our confidence levels started surging we soon ticked off more rides at Bingin, Padang Padang Right and Impossibles. 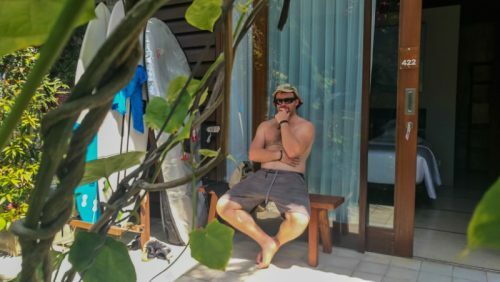 Then, Ross pulled up a surf report and all our attention shifted to the possibility of surfing Uluwatu for the first time. 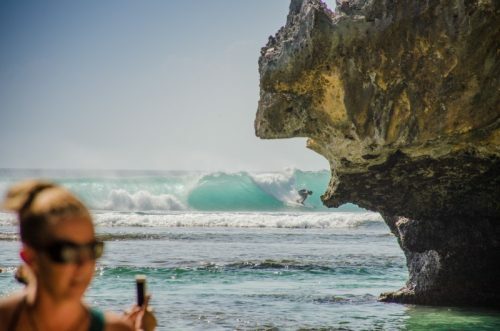 We’d gathered that Uluwatu was a break best left to those with the skill and nerve to navigate its often large and powerful barrels that break with bone-crunching force on shallow reef. It’s not a wave to be trifled with, but we decided to go see it for ourselves. Situated on the southern tip of the Bukit Peninsula, Uluwatu is perfectly positioned to receive the biggest swells the Indian Ocean can muster. Massive limestone cliffs and an expansive line-up make Uluwatu even more intimidating. We arrived on the high tide and the intensity of the rip on the high tide was vicious. The cave at Uluwatu is where you enter and exit the lineup and we watched surfers being swept from the cave and dragged far down the point in no time at all. It looked sketchy and the paddle was going to be monumental. We observed the line-up, grappling with our fear and contemplating consequences. Ross was fighting a ferocious internal battle. He wasn’t comfortable and nor was I. Eventually Ross suggested that we give the surf a miss. We stared on blankly in silence as the surf exploded on the reef below. Recent events in Uluwatu had cast a darker shadow over our endeavour. 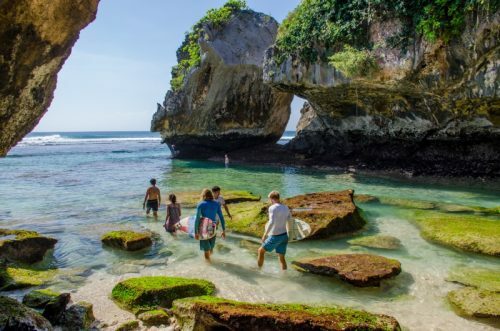 Just three weeks before our arrival in Uluwatu, Jae Haydon, an Australian surfer and musician perished in these waters. His body was discovered in the region of Impossibles near Padang Padang. 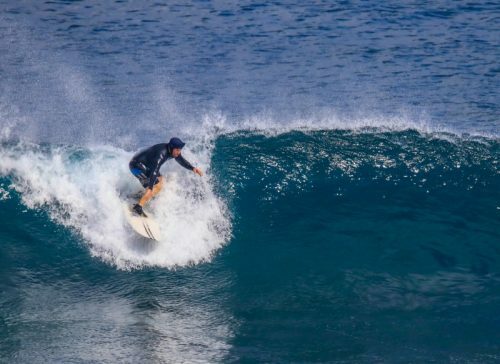 Yet, here we were and the thought of missing my only opportunity to attempt surfing Uluwatu was crushing me. Our window of opportunity was slipping away and I knew I had to push Ross harder to commit. Ross looked at me and smiled. “Don’t worry G, you’re not paddling out there alone”. It was on! I kissed Maree goodbye, hoping it wouldn’t be the last time I saw her. Minutes later we were in the cave with my heart pounding. Neither of us had ever felt this tense before a surf. “Have faith in your ability, we can do this”, Ross said reassuringly. Fear was replaced by calm as we stepped into the turbulent waters of the cave. Adrenalin surged through our veins. We paddled into the sunlight and into the unknown. Beyond the chaos of the cave, the rip swept us quickly around the point and we spent the next 15 minutes paddling into position at ‘The Peak’. 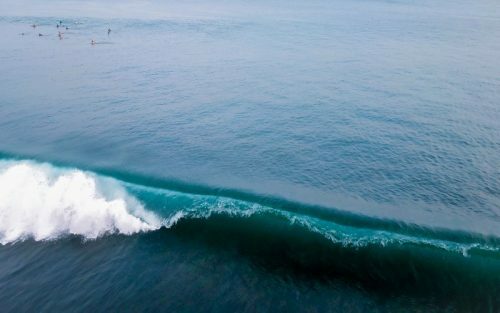 We watched in wonderment as more experienced surfers dropped into the bowels of thick pits that only Uluwatu could conjure up. The power and perfection of these waves was incredible. I looked around at the pulsing surf and jagged cliffs. I couldn’t believe we were sitting in the lineup at Uluwatu! It was a surreal moment. The size and power of the surf was overwhelming and with the tide dropping, we decided to hustle a wave and head for dry land. All we needed was one good wave. Ross scavenged a rare mid-break right which he rode back into the cave. He was safely back on land. 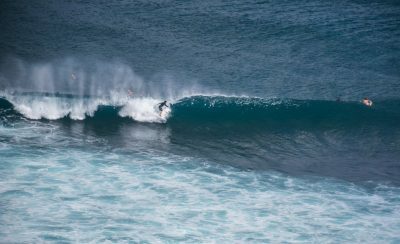 A while later, the Gods of Uluwatu spawned a solid left for me. I stuck the drop sweetly and rode the wave out onto the shoulder and paddled hard to make it back into the cave before being swept back around the point. 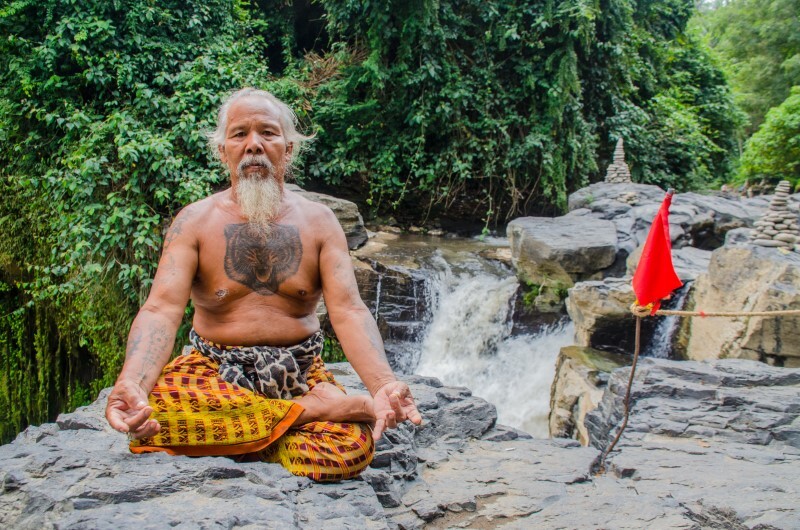 A Balinese woman conducted a Hindu prayer ritual in the cave and the smell of incense filled the air. We were blessed, we were alive, and we had endured one of the most intensely special surfs of our lives. 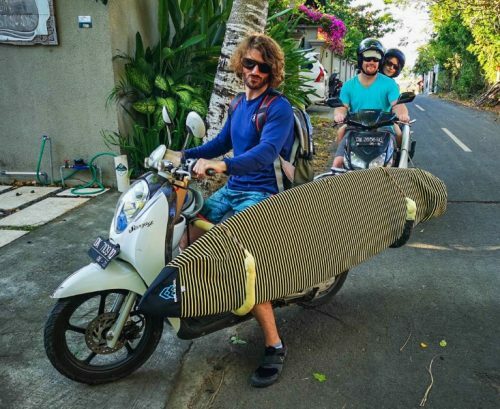 We left the Bukit buzzing after surfing Uluwatu, but with high hopes for Keramas. We booked into the chic Komune Resort. We caught some great waves. That evening, we congregated at the Komune Beach Club for dinner and a few Bintangs to celebrate our arrival in Keramas. I ordered the ‘Chicken Schnitty’ which was delicious up to the point that I discovered toilet paper under my schnitzel. 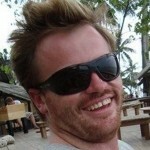 I called the waiter over, thinking that perhaps it was a Balinese custom of sorts. 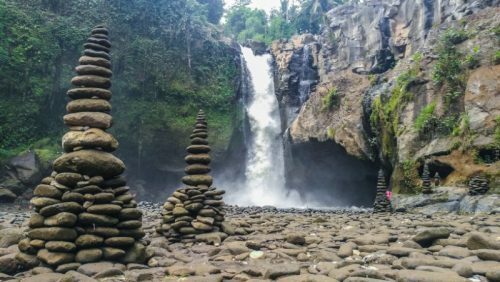 The surf report for Keramas wasn’t looking good for the remainder of our stay so we decided to explore the region of Ubud, the cultural epicentre of Bali. Bred, a local tour guide and surfer took us to the nearby Tegenungan Waterfall and famous Tegallalang Rice Terrace on the outskirts of Ubud, both in easy reach of Keramas and well-worth the effort. 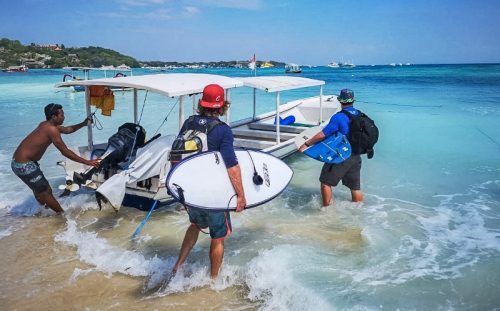 Bred suggested that we catch a ferry to the nearby island of Nusa Lembongan to surf a break called Shipwrecks so we boated across the Badung Strait from Sanur the following day, reaching Lembongan in time for the tide. Shipwrecks was crowded so we chartered a boat and headed for the nearby Nomans reef instead. Our captain couldn’t speak English but he knew exactly what we were after. 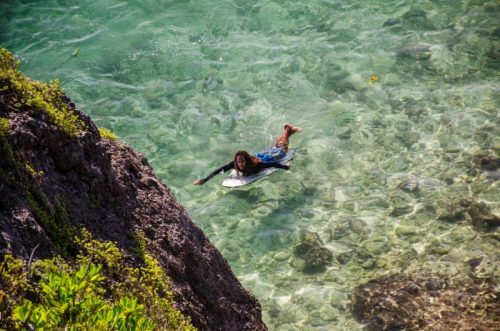 Crystal clear water and a fun, consistent right lay before us and we had it all to ourselves — what a pleasure! 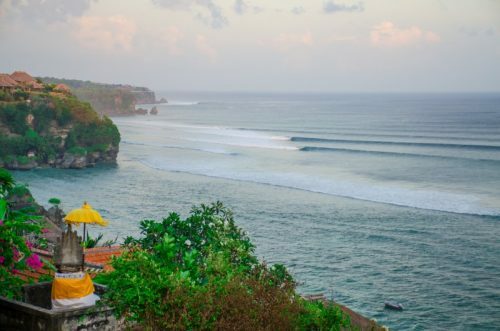 An empty lineup is a rare treat in Bali and it’s days like these that make surf travel so glorious. This was Bali magic! After conquering Nomans, we squeaked another quicky at a nearby break called Lacerations to top off the day before catching the ferry back to Sanur.